This 4 bedroom 2 bath home with a wraparound deck sits on a 1+ acre corner lot between Petoskey and Charlevoix. The inside has 2 fireplaces, 3 bedrooms on the main floor, and a totally redone walkout basement. You get a quiet country setting and a large yard, but you are still only 15 minutes to town. 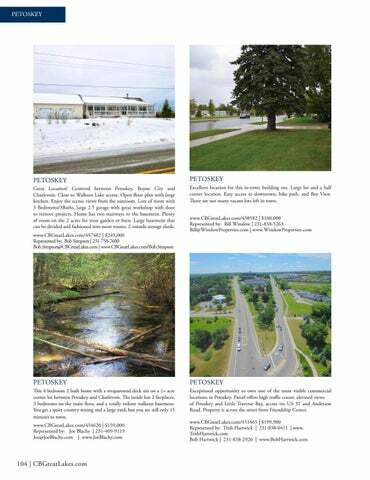 Exceptional opportunity to own one of the most visible commercial locations in Petoskey. Parcel offers high traffic count, elevated views of Petoskey and Little Traverse Bay, access via US 31 and Anderson Road. Property is across the street from Friendship Center.